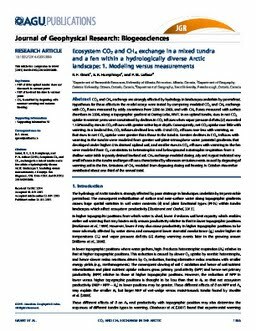 Grant, R.F., E. Humphreys (Elyn) and LaFleur, P.M.
CO<inf>2</inf> and CH<inf>4</inf> exchange are strongly affected by hydrology in landscapes underlain by permafrost. Hypotheses for these effects in the model ecosys were tested by comparing modeled CO<inf>2</inf> and CH<inf>4</inf> exchange with CO<inf>2</inf> fluxes measured by eddy covariance from 2006 to 2009, and with CH<inf>4</inf> fluxes measured with surface chambers in 2008, along a topographic gradient at Daring Lake, NWT. In an upland tundra, rises in net CO<inf>2</inf> uptake in warmer years were constrained by declines in CO<inf>2</inf> influxes when vapor pressure deficits (D) exceeded 1.5kPa and by rises in CO<inf>2</inf> effluxes with greater active layer depth. Consequently, net CO<inf>2</inf> uptake rose little with warming. In a lowland fen, CO<inf>2</inf> influxes declined less with D and CO<inf>2</inf> effluxes rose less with warming, so that rises in net CO<inf>2</inf> uptake were greater than those in the tundra. Greater declines in CO<inf>2</inf> influxes with warming in the tundra were modeled from greater soil-plant-atmosphere water potential gradients that developed under higher D in drained upland soil, and smaller rises in CO<inf>2</inf> effluxes with warming in the fen were modeled from O<inf>2</inf> constraints to heterotrophic and belowground autotrophic respiration from a shallow water table in poorly drained lowland soil. CH<inf>4</inf> exchange modeled during July and August indicated very small influxes in the tundra and larger effluxes characterized by afternoon emission events caused by degassing of warming soil in the fen. Emissions of CH<inf>4</inf> modeled from degassing during soil freezing in October-November contributed about one third of the annual total.